British explorers in the early 1800's quickly realized horses were not cut out for crossing the desert region of Australia's vast arid center. 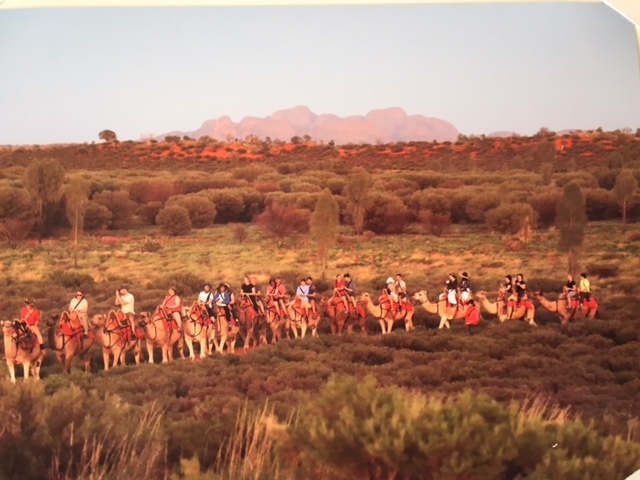 Afghan camels and their handlers were shipped to this remote land down under to facilitate pioneering and discovery in the Outback. Today, there are more camel stations and ranches here than in any other country. 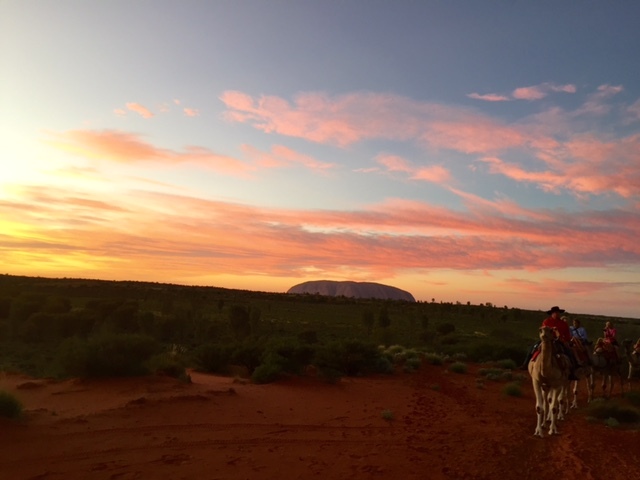 In this Northern Territory resort area, camels adeptly navigate up and down red dunes with the famous Uluru and Kata Tjuta rock formations always in view. 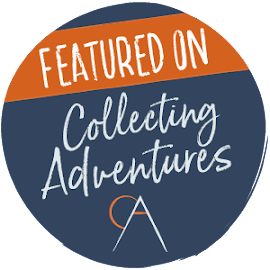 Cameleering is a real occupation; requiring book knowledge as well as hands-on apprenticing. They also learn the centuries old Afghan commands still in use today. 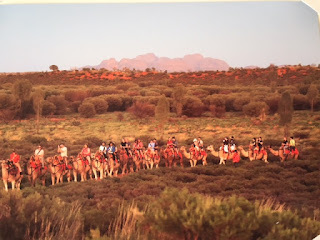 Why did I choose to come ride a camel and walk 6 miles around Ayers Rock in 100 degree heat? My long time friend, Heather has family working here. When she learned I'd booked my flights, she surprised me with this unforgettable experience...oh, the things we do for fun! We started talking and laughing from the first hello hug to the last goodbye, goodbye, goodbye four days later. I had been in Oz for 10 days, acclimated to the heat and had just completed a 5K a few weeks earlier...what's a few more miles! 80° coastal is much different than 100+ degrees in the Outback! By the time we started; folks were heading back to their air conditioned rooms. "Some begin in the dark with flashlights"she tells me. She's done this several times before.....with every relative and friend who visits. Reminded me of when we lived in Boston and the never-ending trips to the House of Seven Gables. But this was a really BIG deal. Bottles of water, bug netting, hat, sunscreen and Hydrolyte tablets...I WILL survive! Excitement and awe fed my momentum in the beginning. Then I got sweaty; changed hats to keep the net looser and not obstruct my vision of the rock. Next I noticed I was always a couple paces behind her, still trying to keep our conversations going. Walking and talking counts double...but eventually I said, "I'll tell you later, I need to breathe right now." Finally the first bench! And another person.....a young person....and she was resting! Okay, maybe I'm not as out of shape as I thought. When we caught our breaths and drank some water, we took each others' pictures. Not attractive, not even half way around....but what's exploring without documentation! We continued on to shady spots, more benches, water stops and moments just to stare at the formations created from erosion. Recent rains had brought varying shades of green to the Red Centre; the contrast with Uluru's ochre pigment was stunning. I felt the spiritual significance as hot, sandy soil slid through my fingers. The sun grew hotter, my feet ached and I may have said "please God" under my breath while saying 'no worries" to Heather. 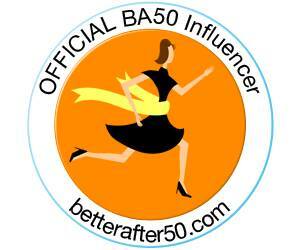 A Hydrolyte fizzling in my warm water bottle did the (mind) trick: I knew I could make it! Three hours later, we saw the car park and felt the high that comes with accomplishment! I'm forever grateful to her for getting me around the Rock! And grateful she later suggested we rest a bit, then walk to lunch; then walk and shop, then walk again to dinner. Without those ten minutes here and there....my legs would have never worked again! Off we were early the next morning...5:30 early! This time it was dark and silent and coolish in the desert as we listened to instructions on how to mount a camel. Heather and I were given their "favorite" (read gentlest.) Sitting up front and hanging on, we leaned back as Darcy raised her front legs first, then the back as gracefully as a waking cat. Easier than getting on a horse, except we were now seven feet off the ground! Camels are roped together; but they know this five-times-a-day routine quite well. 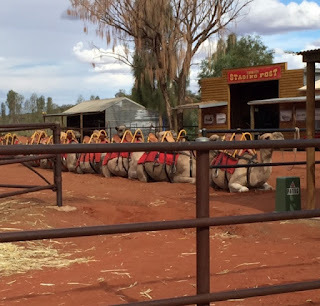 Ten camels make up a 'train' with saddles for 20 riders. We were there on Good Friday; which called for two tourist-filled trains. Head cameleer Mark allowed us only phones. No need for nets or water bottles this early. He showed us the side-to-side rhythmic gait we'd feel and assured us the camels would not notice our weight. After everyone was securely on and up; we started through bushy dunes with the first rays of day lighting our way. A mounted cameleer led the way; others walked along side. As the sun began to rise, we stopped at the highest point for photo ops. The cameleers patiently took everyone's photo with individual cameras while a professional photographer captured us all in formation with gorgeous backdrops. Yulara is the community of resorts and shops; the local school and resident quarters. The permanent population is around 800; made up of staff and their families only. This includes both hospitality professionals and indigenous employees in training. Heather's son and daughter-in-law live and work here in management positions. We chose the beautiful Desert Garden Hotel for our stay. Many rooms have views of Uluru. The restaurants offer great meals and the large pool keeps guests refreshed and relaxed. Just as in big city hotels, there's wifi, cable and electrical adapters available at the front desk. 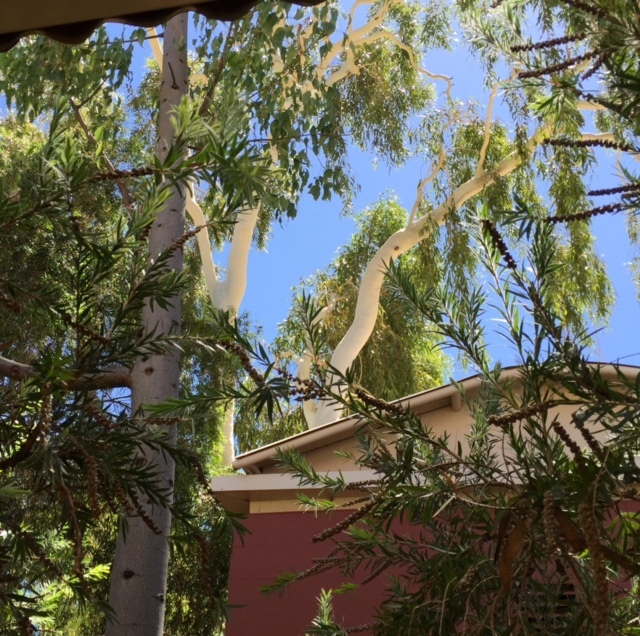 Native flowers and trees fill the grounds, like this tall, striking White Gum trees. 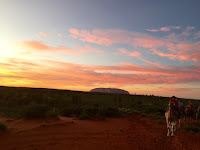 We visited the Olgas, but I bailed on another walkabout; happy to just gaze at the 36 weather-smoothed, sandstone domes. Named after Queen Olga of Prussia; the Commonwealth government handed both Uluru and Kata Tjuta back to the aboriginal owners in 1985. Their original names and spiritual significance are restored and the land is now a National Park and World Heritage Listed. My first time ever sitting in a window seat...the views coming and going to the middle of the Outback were priceless! I can see the Social Studies teacher in my writing; the girlfriend getaway vibe....but mostly this: I'm growing more confident and braver as I grow along! What a wonderful adventure although I could see myself fainting off a camel in the heat. Love all your pics too! Thanks for reading me, Rebecca. Luckily I rode in the early morning coolness! 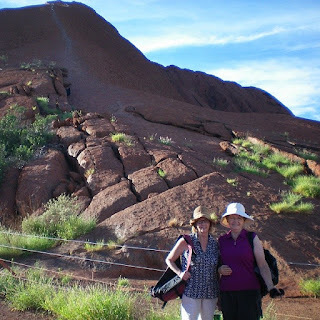 For some reason Australia was not on my list of places to see before… I can see no more (don't love bucket list) until a few years ago!! Good for you, Carla...I hope you get to go! Whet an amazing trip! Such s beautiful, unusual country. And now I want a camel! It's a great country...thanks for reading and commenting, Laura! What fun! I would love to visit Australia one day...after I get into shape haha! I sore hope, you can, dear Rena! Thanks for commenting! Wow! What an adventure. There are so many things to be done--can't do 'em all, but I can read about yours! Thanks. Thanks for reading my travel journal, Risa! Thank you, my friend...I hope you do have a chance to visit someday.